Danniel messaged me at the beginning of September with photographs of a sugar paste figurine she had ordered that had clearly been made in a hurry and not with a huge amount of attention to detail for her 30th Birthday Cake that weekend. It was not in her budget to pay me for another figurine when I quoted her as she had already paid for the figurine from another baker. Realising how important this little figurine was to her, I said if she would travel to me from Pretoria then I could help her fix it. As I was expecting her the next afternoon I had a look at the photos to come up with a solution to fix the figurine she had ordered. It really looked beyond just some cosmetic sugar touch ups and so I decided that I would make her a completely new figurine and I surprised Danniel as she arrived with this pretty Japanese Girl Figurine. Her message saying I had made her year was all the payment I needed for this little sugar piece. Thank you Danniel for trusting me to rescue your birthday cake. Japanese Girl for Shayna’s Farewell! This farewell celebration was so beautiful and so special for my friend Michelle’s daughter who will give a gentle wave goodbye to her family as she sets off for Japan on Saturday. Shayna set her mind on applying to teach English in Japan and it was with much excitement that she was chosen from so many applicants to fulfill her dream. I have had the privilege to know Shayna for the past 12 years and have watched her grow into a delightful, chatty and very passionate young woman who has followed every dream of hers with incredible enthusiasm and dedicated passion. This next chapter of her life will be as exciting and as intriguing as the Japanese characters I have seen her practising as she studies the Japanese language and culture. I made this little Japanese Sugar Art figurine and was inspired by Shayna’s love of this new culture she is soon to become part of, from the gentle and graceful Japanese ladies to the delicate and fragrant Cherry Blossoms. 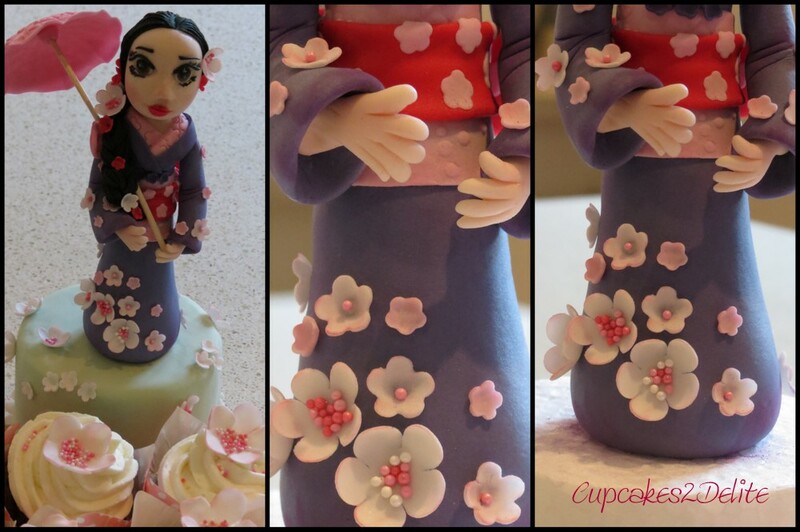 I chose a vibrant purple for the kimono and then a soft pink and colourful red to complete the detail around her waist. These beautiful dresses are detailed in their design and in the way they are tied and I can’t wait for a lesson from Shayna on her return. 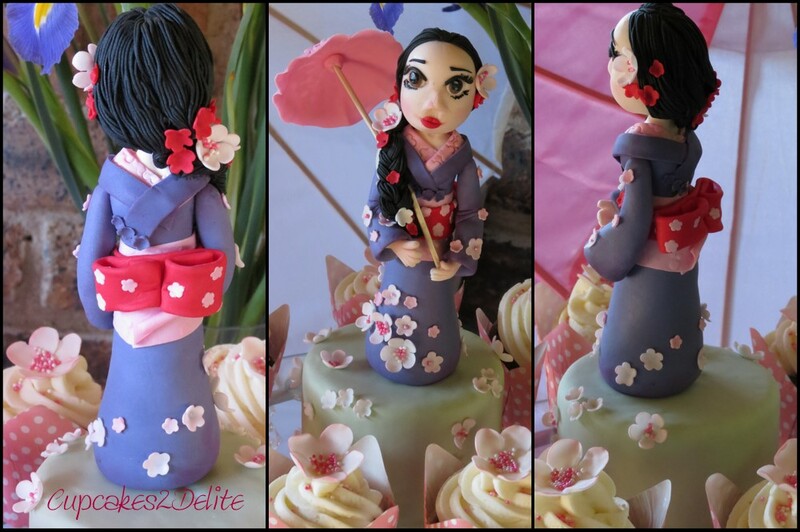 I added cherry blossoms in different sizes to complete the design on the kimono and then added flowers to the plait to complement the gentle look of this figurine. Michelle and Marco as always made everyone so welcome, not only by preparing a delicious meal but by creating the most exquisite Japanese theme for the decor. 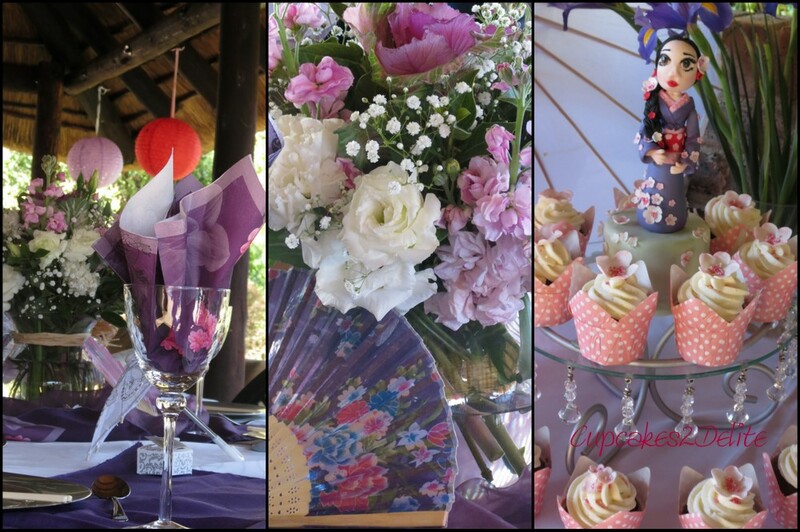 I was delighted that my little Japanese figurine on her cake standing in the centre of the Cherry Blossom Cupcakes felt quite at home in the gentle array of purples, pinks and reds of the umbrellas, fans, lanterns, flowers and table decor. Kimonos off to Shayna’s remarkable parents and brother who although they will miss her madly are allowing her this amazing opportunity to travel to and explore this beautiful country. We are all going to miss you Shayna but I am excited now that we will be able to share your adventure via your blog. Wishing you an amazing and wonderful time!